I have been having a bit of a love affair. I have been drawn to the romantic lately. and slipcovers... all made from something different. so I got out the scissors and turned that something from Overstock into a slipcover. Loving ruffles too! The ottoman is gorgeous covered in ruffles. Can't wait to see your room redo! What a great idea. No need to use these pretty ruffles just for a bedskirt. So many possibilities. Very nice! I love romantic too, your ruffles look gorgeous. Have you seen the Marie Antoinette movie? That movie is the ultimate inspiration. 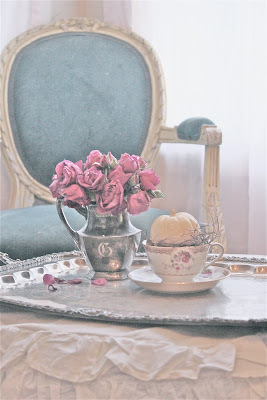 If you love french romantic decor, dreamy whites and pastels, it is a MUST SEE! 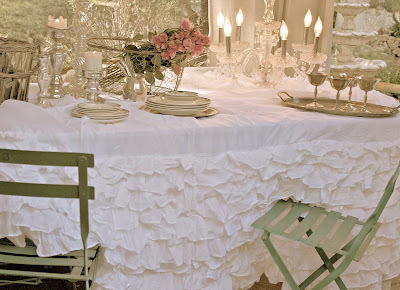 Love it, I've used a bedskirt for a table cloth before, but never one that pretty! Love the ottoman, you are becoming quite the designer! So beautiful and original! I've never seen anything like it. So gorgeous with your things. I'm sure your room will be fantastic! Very romantic, Courtney. Looking forward to the room redo. Ruffles are so romantic looking to me. You did great with the ruffled ottoman - who would have thought to do that with a bed skirt? How gorgeous is that! And so very romantic, I love it. Oh so pretty! 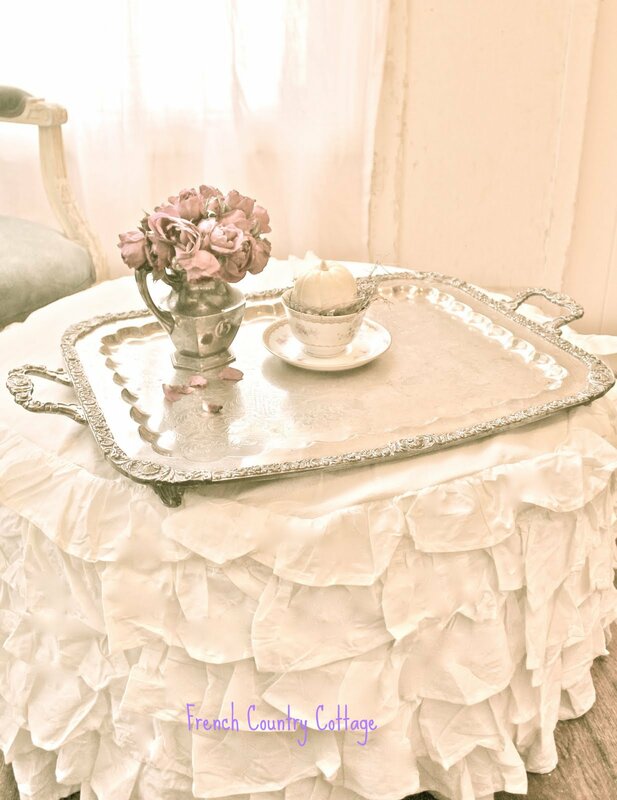 I love ruffles and the ottoman looks perfect with them. Lovely photos. Love it! Something about ruffles...goes with chocolate, bags, and shoes! Yum! Great job! It looks very feminine and I'm sure the entire room is happy. Courtney, Gorgeous with all the ruffles! I can't wait to see more. It's very dreamy and romantic! I am loving those ruffles. 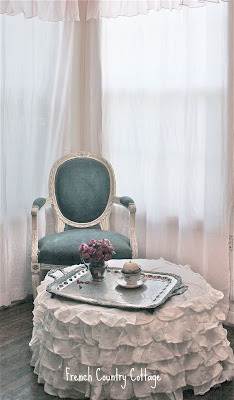 I am inspired to try something like this for my daughter's bedroom that has an all white and silver, romantic look. Thanks for sharing! Oh my goodness Courtney, your ottoman is simply gorgeous! Topped with the tray it is making me swoon. Its just a delightful look. Can't wait to see more. I love the ruffles.They are perfect for your ottoman! Just beautiful! I have a large round ottoman that I would like to do the same and now you've inspired me. I love all of your ruffles! 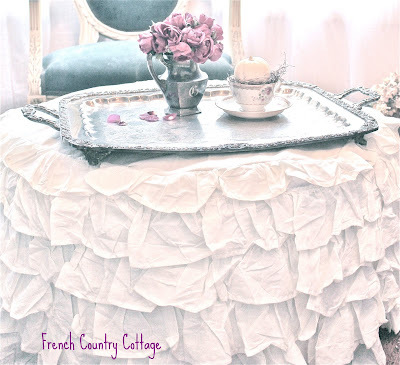 I love love love the ruffled ottoman and can't wait to see more of this room! I love the ruffle look Courtney. Can't wait to see more. Oh my, how beautiful! 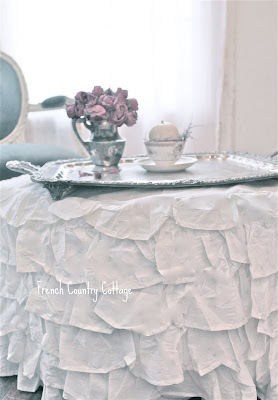 I have this same ruffled bedskirt, and I too purchased it on Overstock.com, and LOVE IT!! I really love the idea of using it on the table...so romantic...I may just have to get another one to do the same. Too, too gorgeous Courtney! I made a bag out of a Rachel Ashwell ruffled shower curtain. I still have some left....what to do? A girl can never have too many ruffles! Brilliant!Beautiful! You are most creative ... and inspiring to look at things beyond their intended purpose .. being original is priceless!.. Love them, love your soft pictures! It was a thrill meeting Rachel. I’m still too shy to look at all the pictures! Thanks so much for your kind comment on my blog. Courtney, thanks for sharing this at Wow. 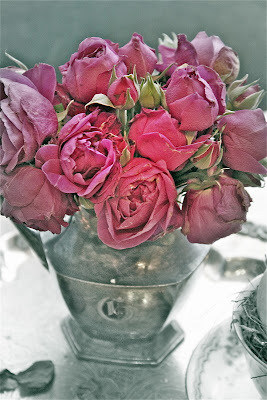 I'm back to say thank your for linking this beautiful project to Potpourri Friday. Many thanks! I LOVE this ruffled ottoman...SO pretty! I showed off your ruffles today on Mod Mix Monday! 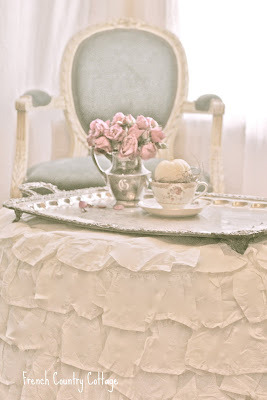 Lovely repurpose...sends my mind a ruffling...thanks for the inspiration!!! Have a beautiful day!!! Loving the ruffles! Keep them coming. Thanks for linking with air your laundry Friday! Oh this is just rufflishious! Would love to do this to my ottoman! I'm gonna have to look a bit more closely at those dust ruffles I see at my local thrift shop from now on!